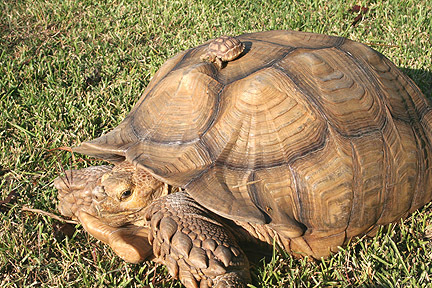 The African spurred tortoise (Geochelone sulcata), also called the African spur thigh tortoise or the sulcata tortoise, is a species of tortoise which inhabits the southern edge of the Sahara desert, in northern Africa. Sulcata tortoises are herbivores. Primarily, their diet consists of many types of grasses and plants although a small portion of their diet also consists of fruit. Their diet is high in fiber and very low in protein and the consumption of too much protein can cause their shells to take on a pyramid appearance, a common problem with captive specimens. Here you may post messages or questions pertaining to all aspects and issues regarding the keeping, breeding, health, and conservation of Sulcata and Spurred Tortoises.